Almost wordless: I leave native plants and seedheads in the winter garden as a source of food and shelter for birds and small animals. When it snows they provide some interesting photos. Although it looks black & white, this was taken in color. 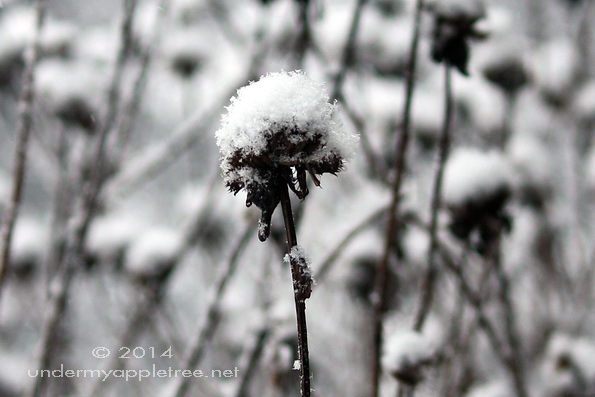 As I just commented on another blog, I love photographing seedheads and weeds in the snow. I leave them up all winter. I can almost feel the softness of the flower. Lovely. Perfect for this b&w shot. Here’s my Wordless Wednesday: Oregon! Wow, the landscape is really colorless in winter, isn’t it? I love this photo! I’m glad you mentioned it was in color – I had assumed it was black and white. Very pretty! Wonderful “B & W” photo! Well done as always, Leslie! It looks so cold, but lovely.